Home Hair Multiple Hairs Growing Out of One Follicle, What to Do? 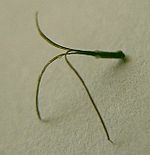 Have you ever looked down while shaving your legs and noticed you have two hairs growing out of one follicle? Men, have you ever seen this phenomenon in your five o’clock shadow? You may even want to relate it to shaving. The good news is; this condition isn’t caused by shaving at all. As a matter of fact, one may have two hairs in one follicle the entire life. This article will help you understand this condition, what causes it and ways you can minimize it. 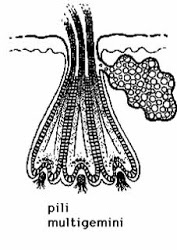 When you have two hairs one follicle it is known as pili multigemini. It can be a rare disorder, but may not be rare since people don’t really report it very often. The condition occurs when more than one hair grows out of only follicle. When you see it, you notice that it looks like flower stems contained in a vase. Studies show that there are follicles that lie very close together separately and then join together at the base of the hair canal. They each produce one hair, but exit a single follicle. People with this condition may get folliculitis or inflammation of the hair canal. Because it is considered a rare condition, it isn’t completely normal but often a harmless condition unless folliculitis develops. Figure 1 shows the inside of a normal hair follicle with only one hair emerging. It is believed that when there are two hairs in one follicle, the process begins as two follicles that have merged together. Two hairs one follicle or pili multigemini can actually be two or three hairs growing from the same follicle. Above you can see that it looks like the stems of flowers coming out of a vase. Figure 3 shows the side view of a follicle that has multiple hairs growing together. You can clearly see that the process begins at the bottom of the follicle where the root of the hair lies. When you have two hairs one follicle, it is actually a rare disorder where the tips of your hair papules actually separate into numerous shafts of hair. It commonly occurs in male beard hair and kids scalps. Women have experienced the disorder in their armpits and legs. There is one hair follicle as normal and one bulb at the base. The papilla or actual hair bud splits as the hair grows. The hair that grows does have separate cuticles from each hair, but they come out of the hair canal as two hairs. 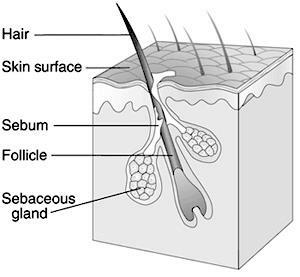 In normal hair growth, one hair grows out of each follicle. Researchers still have not found the actual cause for this condition, but there seems to be a genetic factor. One noted suggestion by researchers is that the papilla is subdivided and it appears to merge together as one. This may be due to the re-growth of embryonic cells that were present prior to birth. Another possible cause that researchers found is inflammation in the scalp area that causes scarring. This includes folliculitis and dissecting cellulitis. Plucking - Some people with the condition attempt to “pluck” the hairs from the follicle. These hairs tend to be harder to pluck as they root deeper than the normal hairs, and will grow back as two hairs one follicle in the future. Shaving - The hairs can be shaved off when they grow in, but again this is only temporary. Shaving has been found to help reduce the incidence of folliculitis and infections. Electrolysis - Electrolysis is an effective way to permanently put the hair follicle to sleep. The only issue is the expense to treat each individual follicle and if the condition is widespread, it could prove to be quite costly. Also, there are no studies that show this method is actually effective for permanent removal. Cryosurgery - There are some studies looking into the effectiveness of cryosurgery to completely remove the affected hair follicles. Try to reduce frequent hair treatments. Keep intense hair treatments to a minimum. This includes heat tools (blow dryer, curling irons), heavy hard brushing, hair straighteners, hair dyes, and permanent solutions. These can be rough on the skin of the scalp and the hair follicles. Avoid isotretinoin. This medication and acitretin are used to treat acne and aging skin. They can also disrupt the function of the hair follicles and should only be used if absolutely necessary. Avoid sun. When you go out in the sun, keep your head covered. Sunlight and sunburns can be damaging to the hair follicles. Also increased sweating can block the ducts and lead to infections. Use gentle products for sensitive skin. Harsh shampoos, soaps, conditioners and lotions can all irritate the hair follicles and lead to inflammation or infection. Keep hair short. To avoid excess weight on the head, wear shorter hairstyles. The weight and heat created can be harsh on the hair follicles.